Everybody is afraid of something, sometimes, somewhere. Quinn and Will are in good company. There are plenty of kids (and some grownups, too) with a feeling of rejection for an injection at the doctor's office and not a few kids (and adults) who cringe at creepy, crawly things. And Henri? He's terrified by math. And who wouldn't be, confronted by a chalkboard covered with Einsteinian equations? On the other hand, there are some irrational fears that kids might not want to be made public. Case in point, Fern, afraid of her bath, or Claire, fearful of legumes! 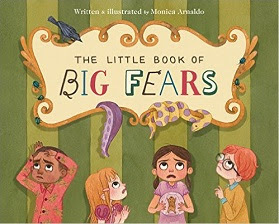 With whimsical couplets and quirky illustrations that poke a little bit of fun at childhood phobias, Monica Arnaldo's The Little Book of Big Fears (OwlKids Book, 2015) gives queasy kids some cover by including the usual scary suspects--from the dark under your own bed to what's under there below in the lake--and even softens the scare with paisley and polka-dotted snakes for the ophidiophobic Mina. An off beat alphabet book, this one even leaves out a substantial chunk of the letters. What's with that? some big, some very small. And so not in this book. And for a phobia-busting pair, read this one with Emily Gravett's Little Mouse's Big Book of Fears (Kate Greenaway Medal).